The Abbey of St. Bertin was a Benedictine monastic abbey in Saint-Omer, France, which now in ruins that are open to the public. It was initially dedicated to St. Peter but was rededicated to its second abbot, St. Bertin. The abbey is known for its Latin cartulary (Chartularium Sithiense) whose first part is attributed to St Folquin. The abbey was founded on the banks of the Aa in the 7th century by Bishop Audomar of Thérouanne, who is now better known as St. Omer. 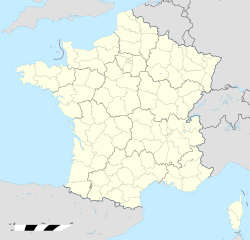 He sent the monks Bertin, Momelin, and Ebertram from Sithiu (now St-Omer) to proselytize among the pagans in the region. The abbey soon became one of the most influential monasteries in northern Europe and ranked in importance with Elnon (now St-Amand Abbey) and St. Vaast. Its library included the codex of the Leiden Aratea, from which two copies were made. The Annals of St Bertin are an important source of the history of 9th-century France. Already in the 9th century, the abbey had a priory in Poperinge. A Romanesque church was constructed in the mid-11th century. It was 25 m (82 ft) high with a 48-meter-high (157 ft) tower. It included a large 14th-century semi-circular sanctuary with five side-chapels. It served as a model for the church, whose construction was not completed until the beginning of the 16th century. Bishop Herman of Ramsbury was a monk at the abbey from 1055 to 1058, having abandoned his duties but not his title, which he resumed upon his election as bishop of Sherborne. From 1106, the abbey had the right of appointing the priests at Lissewege and Ruiselede. William Clito was buried here in 1128. The abbey had a 'refuge-house' in the now-demolished Sint-Lodewijkscollege in Bruges. The abbey ceased to flourish after the 13th century, although it survived until its closure during the French Revolution. In 1830, the commune ordered the demolition of the church, though they spared the tower. The buttress they erected to support it is still visible, although the tower itself collapsed in 1947 owing to damage sustained in the shelling of the town during World War II. St-Omer's town hall was constructed with stone removed from the site in 1834. ^ Some carved capitals and fragments of mosaics from this structure are conserved in the museum in Hôtel Sandelin, St-Omer. Wikimedia Commons has media related to Abbaye de Saint-Bertin (Saint-Omer).